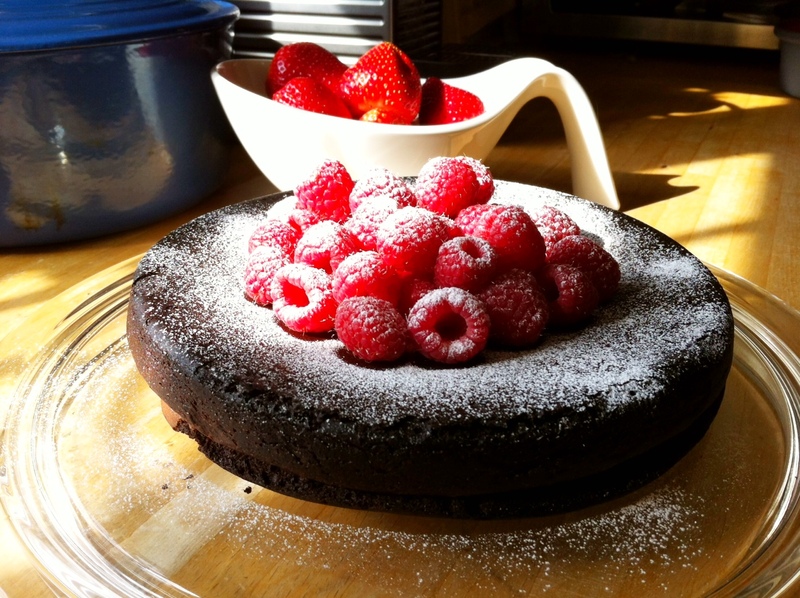 The original recipe calls for a 23cm round cake tin. In a heavy bottomed pan, melt the chocolate and butter over simmering water before setting to one side. In a bowl, whip the egg yolks with half the sugar (125 grams) until pale yellow and fluffy. In another bowl, beat your egg whites until they form stiff peaks. Then add 1 tablespoon of sugar to the egg whites. Repeat every 20 seconds by adding 1 tablespoon of sugar each time until all the sugar is gone and you’ve got a stiff meringue mixture. Fold the chocolate into your beaten egg yolks. Then gradually fold in your white meringue mixture in two lots, until it’s mixed through. Pour your cake mixture into your tin and bake for 40-45 minutes or until a skewer comes out clean. If your cake sinks, turn it upside down and disguise under lovely fresh fruit and give it a good dusting of icing sugar. Serve as it is or ideally with some double cream.